Sometimes the newlyweds are the last ones leaving the reception hall. Imagine that you have this beautiful wedding day where your friends and loved ones are there from beginning to the end, you close up for the night after a night filled of joyous festivities. You decide to walk together out of the reception, and you want to have a special moment. However, it is raining. This wedding couple did exactly just that! They were among the last to leave and it was less than favorable weather conditions. That can happen! Sometimes rain can truly make moments captured more special and magical. It is adventurous and unexpected shots that can be fun to do! 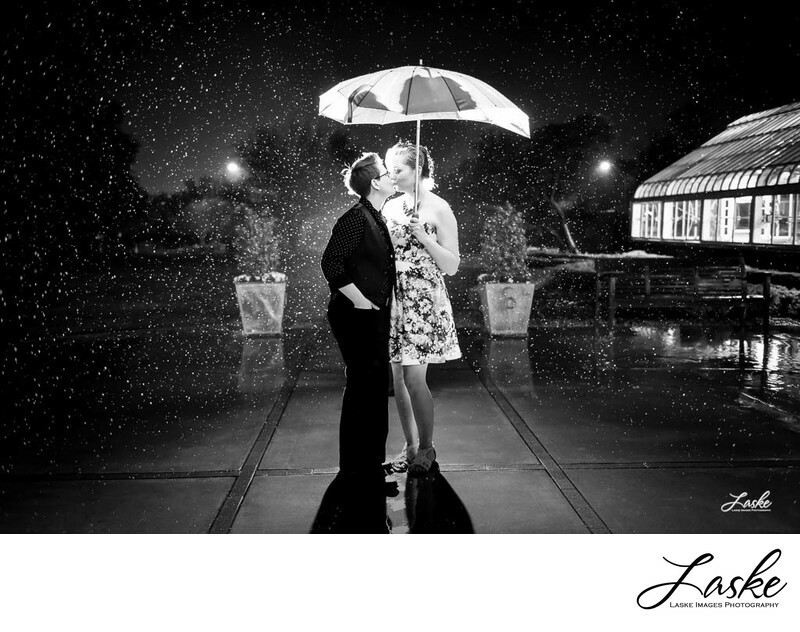 Robert asked the brides if they would like to kiss in the rain. He took out his umbrellas from his gear he brought and gave them one to use for the moment. He was ready with strategies to overcome the weather while providing an image that will be cherished by the couple. So if you were worried that rainy weather may ruin your day? Rest assured because rainy days can be awesome! Robert took this image at the Ed Lycan Conservatory at Will Rodgers Park. Location: Ed Lycan Conservatory at Will Rodgers Park, Oklahoma City, Oklahoma.